I just watched Takeshi Kitano's film Dolls and was so moved by it that I decided to write about it here. I found the film quite slow at first, but after a while I relaxed into it and found both the images and the simple narrative to be very captivating. The music is appropriately sparse and sad, being scored by Joe Hisaishi (who has scored many films including Spirited Away). The acting is mute, but despite this it manages to convey a great deal of emotion (similar, perhaps, to Robert Bresson's films). After watching it I felt both melancholic and hopeful. The story is a sad one, but touching enough that doesn't fall into a pessimistic tale. The film tells the story of two lovers who are precariously tied to each other by both their love for each other, and perhaps a force greater than the two of them. Throughout the film we see flashbacks of their time together, which appears mostly happy. But there is a sadness and distance between them because their relationship came to an abrupt end (which we see at the beginning of the film). Despite this, however, they remain bound to each other, dramatised in the film by the real length of rope which ties them together as they walk the land together. This device works to convey both their real ties to each other (perhaps the man returned to his lover), and their symbolic link. The latter is obviously open to interpretation. Some might see it as a way of dramatising fate or destiny, whilst others might see it as a visual depiction of the material traces which bind them together even after their real separation (memory, history, emotion and so on). Along their journey together, they pass by several people, which triggers other mini-narratives. These take a similar form to the two principle lovers: difficult, temporary, delayed, or failed encounters/relationships. We see some characters trying to have relationships (with varying degrees of success) and we see others running away from them only to return, finally, later in life. In general, these sub-stories are tragic but with enough love to allow hope to survive. Even if the relationships all end (and mostly with death present), the fact that two people managed to come together, if only for a few moments, seems to overcome the sadness of their end. The cinematography is the main reason that so much emotion is conveyed, and so well. There are many extraordinary scenes in the film: the lovers walking through an avenue of cherry blossoms in full bloom, or walking up a hill covered in snow and lit by a single street lamp. There are even some dream sequences which are surreal and haunting, such as the couple walking past tens of fans blowing in the wind. 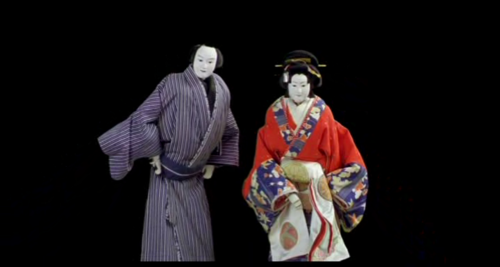 The film begins, interestingly, with a scene from a Bunraku performance (a traditional form of Japanese puppet theatre). This short sequence foreshadows later events in the film and is also sets the style and tone for the film (Kitano himself has said that the film is Bunraku in film form). I found it very expressive and I liked the combination of puppets with live action. It also has to be said that the costumes in the film are amazing. 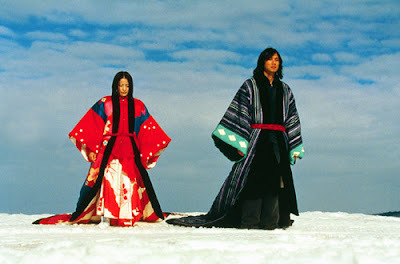 Late in the film, the two principle lovers dress in costumes similar to that of the two Bunraku puppets and this looks great. 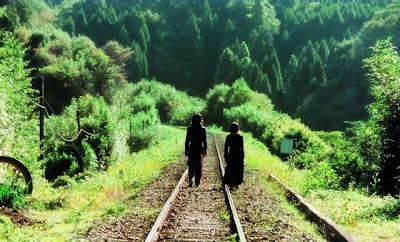 Although death is a prominent theme in the film, I didn't feel despairing or depressed after watching it. In fact, quite the opposite. It was sad and moving, but there was so much love in the film that it managed to avoid the negative connotations that films usually surround death with. The actors and actresses convey a lot without much dialogue, and this heightens the emotion of the film. I was reminded of another of his films, Hana-Bi, and after watching Dolls I do want to go back and see his earlier film again. Kitano strikes me as a hugely talented director, more so now that I've seen Dolls. I look forward to seeing more by him and I encourage everyone to see Dolls if they get the chance. It's slow, it is partly about death, but it managed to touch me deeply with it's tenderness and bitter-sweet love.